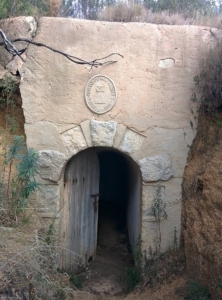 This walk takes about an hour and a half to two hours including time to explore the bunker. The whole walk is very easy. 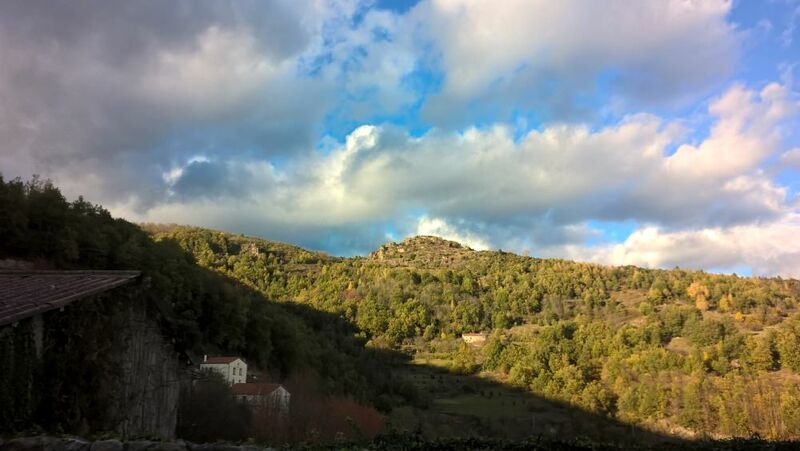 The walk starts from the village of Agullana which is reached by turning right at the roundabout at the bottom of La Jonquera opposite the exit for the big red shopping centre La Gran Jonquera. Once in Agullana make your way to Carrer La Pinyareda where you will find the restaurant, La Pinyareda. The easiest way is to head for the centre and then follow the signs. Park in the road outside the restaurant. A word of warning – the walk is not marked and we found it by using my phone app for hikers on to which I’d uploaded the GPS track from this walk on Wikiloc. The person uploading the walk didn’t give any instructions which made it a bit challenging to find our way. The photos are also courtesy of him as the ones I took didn’t register on the phone properly, so thank you Gas Mountain. Head up the road and just before you reach the T-Junction at the end there is a path off to the left by a wire fence. Follow it and it will bring you out past a mas set in lovely gardens with a swimming pool where you turn right and follow a path through vineyards. You need to turn left again just before where the path starts to descend fairly steeply with a wood on the right hand side and cross to the woods on the far side of the vines. There you will find a path that crosses a stream. There is a wire fence on the other side with a gap that has a couple of pallets making a very rough gate. Take it. You will come out on a forest track where you need to turn left and then almost immediately left again over a low stone wall and skirt round the ploughed field there, turning right along the bottom edge until you find a short path to a door in the hillside with a sign above it saying something along the lines of ‘fortifications by the 4th Battalion of Engineers’ in Catalan. My researches didn’t reveal very much, but I think it is from around 1940 when a line of defences were built to guard against a hypothetical attack from the north. The tunnel is quite long but dry and amazingly grafitti-free. It leads to 2 chambers; one with spy holes looking out across the plane and the other, on the inside, must have been a place to sleep when not on duty. The tunnel continues on and comes out the other side, and here apparently you are meant to carry on round to the front to see something else before doubling back, but we didn’t realise and turned back straight away. You then need to make your way back to the forest track. Turn right and follow it down the hill. Eventually you will see a path on the left that leads up a steepish slope. There is a pink marker on a tree at the bottom of it. Go up here and head to the top where you will find another forest track and a signpost indicating a menhir 30m to the left and Agullana 1.5km to the right. 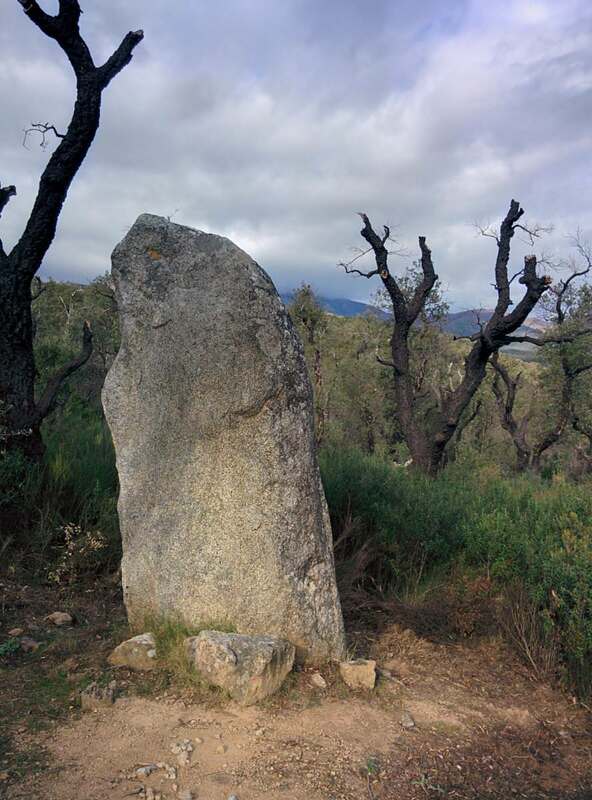 Head up to check out the menhir and the view of the south of the Pyrennees. Once you’ve gazed your fill, turn back round and walk down the hill and follow the track until it turns into a road as you come into Agullana. Head for the centre and take a look round the village which is beautifully kept and has a nice church. Then turn down Carrer la Concordia past the immense café bar which was apparently a hospital in the Civil War and has since been turned into a communal bar. Apparently the prices are low and the food is good. There is also a garden at the back, so perhaps this would be a good alternative to La Pinyareda where we ate. If you carry on more or less straight down the Carrer Oliveres you will eventually see the restaurant in front of you. We decided to miss out starters but the portions were copious so we didn’t need it. I had a delicious seafood paella for €14.50, others had roast shoulder of lamb, pig’s cheek, squid, sole and turbot which was the most expensive dish at €18.50, but apparently the best turbot that Chris had ever eaten. With dessert, house wine, water, and coffee and Spanish brandy for a couple of people, the bill came to more or less spot on €250 for 9 people – a bit higher than we were expecting from a Spanish restaurant but on a par with what we would have paid in France. And we couldn’t complain given the quality and the warmth of the welcome. The only downside of the whole day was the crawl back through Le Perthus due to the Sunday afternoon shoppers. Madeleine McMullin runs Source Marketing, a marketing and web design company based in the P-O.